Public Service (Lok Sewa) is very attractive among Nepalese because it is regarded as one of the most credible modes of recruitment. It is most secure, have attractive wages and facilities. Public Service Commission Nepal (Estd. 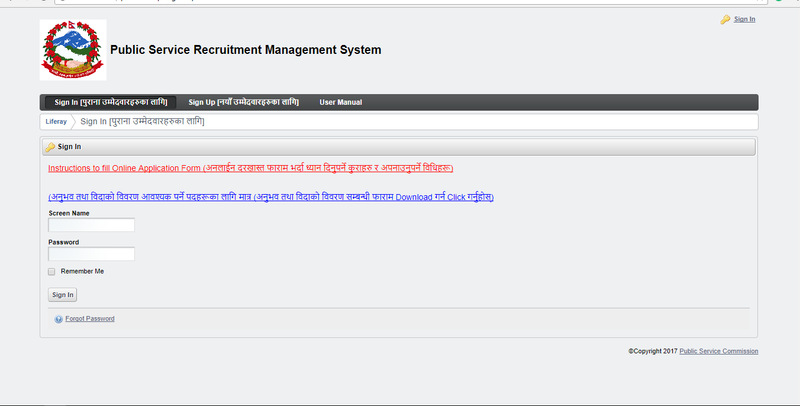 2008 Asar 1 BS) is an independent constitutional body involved in selecting meritorious candidates required by Government of Nepal for Civil Service Vacancy. It is mentioned in the present Constitution of Nepal 2072. Fill all the required fields and click "save"
Now you reached "Education". Click 'Add New Details", you see a popup, fill all the educational details from SLC to higher (one after another) and click "Next"
If you have any training, then fill the details, if not leave blank, For Medical students, Medical council details are required, for other leave blanks. For Nepal government employees declaring all the experience details is mandatory. For applying in internal category and age relaxation, please mention working status as 'Working' in your current experience only and for previous experience please mention working status as ' Transferred'. You have now reached to Upload session. Upload your Scanned Photograph and Scanned Signature. (Note: scan your signature on a white blank paper and upload). Upload your experience Document and/or Inclusion Group Certificate (this is only for Nepal government employees). Upload Your Minimum Qualification Document. (Your minimum qualification, SLC, Plus 2, Bachelor's degree or Master's degree). Upload your Equivalence Certificate (for Foreign Studies). And click "Next"
Now you get your master id (See top left). This master id is necessary for PSC Payment, PSC Exam, and Result. Keep in mind that this master id you can be used for Next upcoming exams in future. You must not necessary to upload details for the future which you have already uploaded now. Check all the details in Preview session, if any mistakes found, go back and edit. This is the last page for application for a new vacancy in PSC. Select service and class as mentioned in the advertisement by psc and Click "View All"
Select the Advertisement Code, and select the group from where you belong. (eg. For Female, Select Khulla and Mahila) and click "Process"
This last detail must keep with yourself for the Bank payment. Also, See detail for Bank Payment. These are the branches of banks and post offices that are only from where we can pay online to Lok Sewa Ayog.